Old Kennels Farm01531 635024work Self-cateringHere at Old Kennels Farm we have six comfortable cottages sleeping 2-6 people. The holiday cottages are conversions of old farm buildings and are all named after old varieties of cider apples – Sweet Coppin, Tom Putt, Yarlington Mill, Dabinett, Brown Snout and Slack-Ma-Girdle! 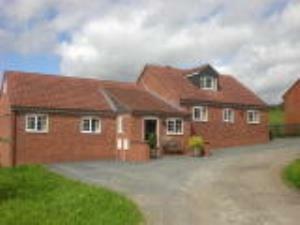 The farm, with its self catering cottages, is situated on the edge of historic Ledbury in picturesque Herefordshire. There are many places of historical interest, a variety of public houses and restaurants, a small leisure centre, a swimming pool and a gym. A lovely assortment of small individual shops and two larger supermarkets – one only ½ mile away. Old Kennels Farm offers weekly bookings starting on Saturday. First floor flat/apartment. Double bedroom with ensuite bathroom. Sorry no pets. Slack-Ma-Girdle offers weekly bookings starting on Saturday. Tom Putt offers weekly bookings starting on Saturday.